Charlie Palmer enlightens his guests at Aureole’s with his award winning, culinary skills in Progressive American Cuisine. His flair for boisterous flavors and unique combinations, with a touch of French technique, creates a piece de resistance on every plate. Charlie Palmer enlightens his guests at Aureole’s with his award-winning, culinary skills in Progressive American Cuisine. His flair for boisterous flavors and unique combinations, with a touch of French technique, creates a piece de resistance on every plate. The ambiance created by restaurant designer Adam Tihany displays the impressive haven that contributes to the theatrical theme of Las Vegas. After delighting in an delicious, culinary fare; feast on one of the many desserts, each a unique work of art. Dine on the patio for the ultimate Strip setting. 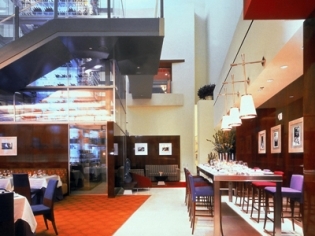 Aureole is also well known for it’s award-winning wine tower. The tower stands 42 feet, is constructed of glass & steel and filled with 10,000 bottles of wine which are retrieved by “wine angels” who hoist themselves up on pulleys to retrieve your selection.